Haven't been in this pub for years. It has had alot of different names over the years the oldest i can recall in when this used to be an irish bar called o'neills. 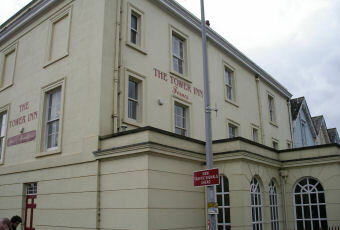 It has also been called fermats number then a strip bar called the tower inn. I think the pubs location dosen't do it any favours really. It is neither here or there and often overlooked on the pub crawl into town. Also having the imperial down the road dosen't help it either. Visited again on Saturday and it was pretty busy at lunchtime. 3 beers on - one from Bridgetown (Alfreds Ale?) at �1.99 which was very good plus Skinners and Sharps. Tried the food this time - I can only describe it as "OK" and I certainly wouldn't rush back to eat here again. Visited yesterday after the Beer Festival. I initially thought that I'd walked into a Spoons - similar furniture, layout and atmosphere although being empty at 1700 on a Saturday can't be a good sign. 4 beers on offer, 2 from the Bridgetown Brewery, one at �1.99. The beer we sampled was fine but it does annoy me to have to keep asking for a top up. Food menu looked rather expensive compared to the beer.